Whatever size of hoops we have, I think it safe to say that we will always dream of bigger ones!! At the moment my favourite hoop is my 200 mm x 200 mm (8″ x 8″) hoop but and I am waiting for a 10″ square one to be released for my Husqvarna Epic. Little by little the hoops available for our machines are growing and one day I suppose the ultimate 14-16″ square hoop will be a reality for non commercial machines, without the need to turn it round half way through the stitch out. In the meantime we can however still create mega embroideries with a little practise and skill with our “sensible” medium sized hoops. I think that the best way to gain confidence in positioning embroidery designs alongside each other is to start in a small way with designs using our smaller hoops, like these shown here, as the bigger the design the more accurate we have to be. A little misalignment will not be so obvious in a design stitched out in your 4″ x 4″ or 5″ x 7″ hoop. As your confidence builds you will move on to larger combinations. I do encourage you to start and practise doing this. Even though you could probably stitch this embroidery out in one hooping the point is learning how to position each one accurately, so that eventually you can combine embroideries that seemed impossible because of the limitation of the hoops that you own. There is great satisfaction in being successful, and it encourages me to attempt greater challenges. I would like to share a few tips to help you. Firstly never hurry the positioning of designs. You need to be relaxed and not under any pressure at all. Clear the decks, and get all the materials you need at hand. A new needle and freshly wound bobbin are always the best way to start a challenging project. 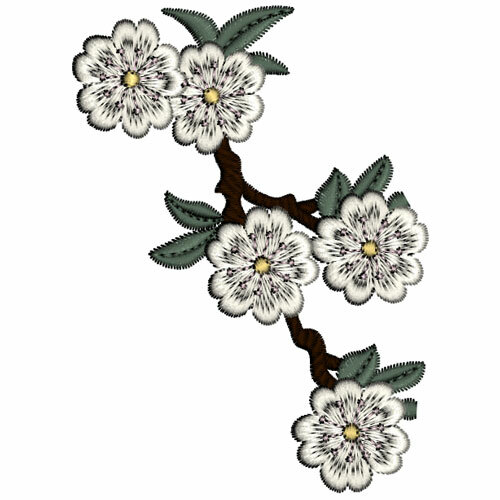 Study the designs on the screen of your machine or better still in your embroidery software, so you are familiar with how each design is positioned in relation to the others. 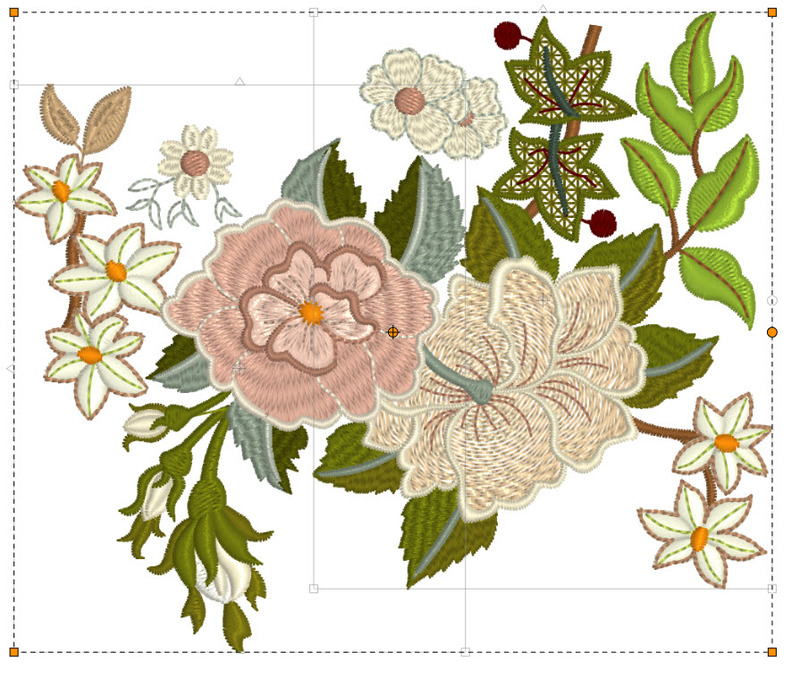 My Outline alignment stitches (OAS) have been designed to show you the shape of the whole embroidery design. The gap between the actual design and the red OAS is usually 1.75 mm. This is stitched out on just your hooped stabiliser. The fabric is then added and attached with temporary adhesive spray or/and pins and/or hand basting stitches. Be careful to keep pins well away from the stitch out area of your hoop. The second set of OAS hold the fabric in place. When you apply the second design alongside an existing one you need to take time to check its position. If you feel it necessary print out the designs so you can cut real size templates as guides. Triple check everything and remove the hoop from your machine to do this. When you are sat in front of your machine looking across to the needle you cannot see if your positioning is correct. You need to be looking at it directly from above. Trust me I have found this out the hard way. So at very least stand up and get as close as possible, but better still remove the hoop so you can check above and underneath. There are several ways to check your positioning. I like to stick a pin through the top of the fabric and see where it protrudes underneath. In this way I can check that my OAS are in the same place. I also like to move my machine through the sequence of the next design, stopping to check where the needle will pierce the fabric at important and relevant places. If you have other methods please include them in the comments below. We are all learning from each other. Start the embroidery stitch out very slowly. You may want to stop and check things before it progresses beyond the first few stitches. If things go wrong, learn from your mistakes. You are not alone. We have all had terrible disasters, when we felt it necessary to turn off the machine, leave the room and go shopping, so it is important to eventually consider where you went wrong and how you can avoid the same mistake happening again. Now if you want a larger challenge you may find that in my new set of designs, Vintage Grace 2 which is being released today, January 29th, 2019. 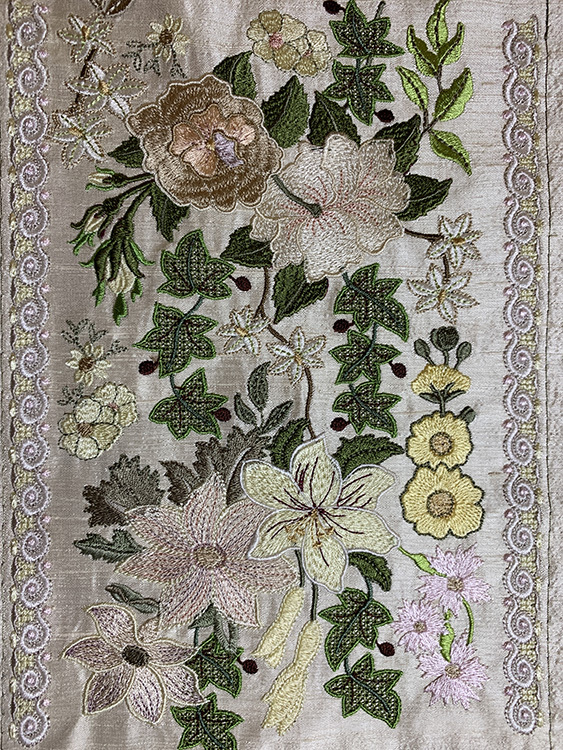 This collection of 5 sets featuring various lilies, ivy leaves and blossoms, along with lace borders, will be released in the forthcoming weeks, but the main elements began as a panel. Here are the first five designs in the second set. Ideally they should fit together to make the panel but that is quite a challenge and maybe best avoided. However they do pair up nicely. Study them carefully. So here is a little exercise for those more experienced with design positioning. Combine GFE-VNG-2-1 with GFE-VNG-2-4. OR combine GFE-VNG-2-4 with GFE-VNG-2-3. There is a little overlap for this one. I combined these in my Premier Plus 2 software, Ultra module and kept the group selectors so you can see how one design is slightly higher than the other. 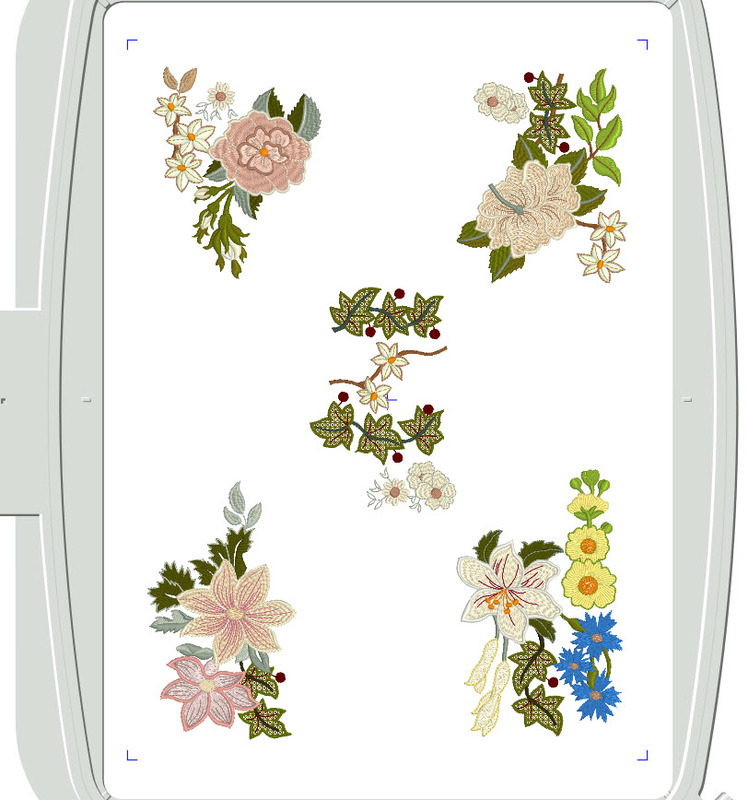 I decided against trying to include the fifth design which comes from the centre of the panel. 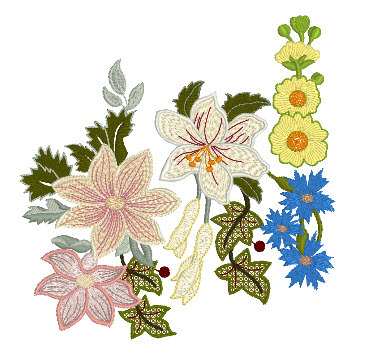 Of course some of these combinations and others will form the basis of designs in Vintage Grace 3 t0 5. I hope you take up the challenge to see what you can combine successfully. 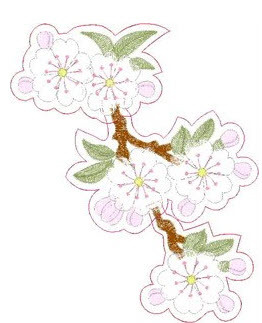 This entry was posted in Discussing machine embroidery, New Designs, Tutorials and tagged combining embroidery designs, Design positioning, Hooping only stabiliser, machine embroidery, Outline alignment stitches. Bookmark the permalink. This is such a great tutorial, very well laid out, and so very helpful. I love that you give us step by step instructions that are extremely clear and concise. This is a great addition of your new video showcasing the designs! Thank you “sew” very much!